Cambridge has so much history. Most people know that Harvard University was the first institution of higher education in the United States. Originally, in 1630, Cambridge was named the capital of Massachusetts. Many tours and guides will give an in-depth historical context of this great city. 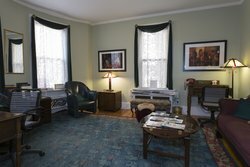 It’s no wonder that Irving House also has a history of its own. Irving House was originally built by Enoch Beane, a local grocer. It was built as a two-family house. In the 1920s the house met the need of an expanding Harvard by converting to housing for students. Interestingly, we are still closely connected with Harvard students and families. This type of conversion became commonplace. Harvard was expanding and needed housing for its students but also, Irving Street is close to Memorial Hall’s dining. Students staying on Irving Street could hear the dinner bell, so the rooming houses did not need to provide meals. In 1943 the house was sold but the people who purchased continued to rent to Harvard students for a year. After a year, the new owners found the students to be too rowdy and chose to accommodate Radcliffe students the following year. After one academic year with Cliffies, the owners thought them even rowdier and converted 24 Irving Street to hotel use. So, since 1945 it has been used as such. The house has rooms on four floors, and no elevator. Irving House installed solar thermal cells on its roof in 2009 to heat guest's hot water. The current owners purchased the property in 1990 from the daughter of the founders of Irving House. One of the greatest parts of coming to Cambridge is getting an idea of the beginning of the U.S. For a deeper look into the history of this area, we recommend booking a tour with our friends at the Cambridge Historical Tours. If you’re looking for a budget-friendly tour, check out these walking tours. 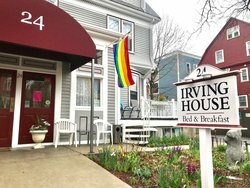 And if you have any questions about Irving House, click here, ask the front desk, or contact us today!